I've been loving a fuller coverage base at the moment which is pretty unlike me, but I've always been enjoying a dewy, more lightweight look for everyday too. I chose to talk about the latter today, sharing my makeup products and routine with you. The star of the show and the product that I'm going to be completely honestly with you about. Before getting in sent to me a few weeks back I'd never heard of the brand, but the Erborian BB Crème Au Ginseng* is a new favourite. The shade range is abysmal, but I've got the shade Clair which adapts to my skin tone to make it a perfect match. It's formula isn't anything like I've tried before as it's slightly thicker which I enjoy using as it's easy to blend and build up on the skin. 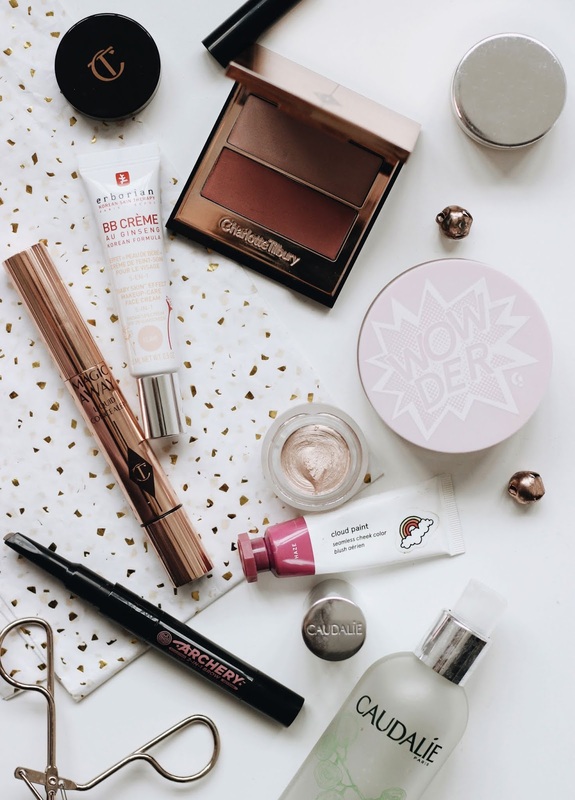 When I want an extra dose of coverage, I reach for the Charlotte Tilbury Magic Away* or Glossier Stretch Concealer to cover redness and blemishes without looking heavy or out of place on the skin. To set my makeup I opt for the Glossier Wowder Powder as it looks like nothing on my complexion whilst lightly mattifying and prolonging my base too. I've already mentioned Glossier a lot in this post, but they do embody the no-makeup, minimal look perfectly and one of my favourite products of theirs are the Cloud Paints. These cream blushers can be blended together to create customisable shades and I like using the shade Dusk to slightly contour my face and then add a pop of colour to my cheeks in the form of Haze. If I want to use something else then I go for the Charlotte Tilbury Seduce Me Blush Duo* which took a little while to get used to as if you're looking for an intense look then this won't be for you. The highlighter adds a slight sheen and the colour is quite subtle, but great if you're already rather flushed from the cold weather. For my eyes, I tend to use my usual mascara, but the Soap and Glory Archery Crayon and Gel* is what I use for simple makeup days. I find that your brows can be the telltale sign that you are wearing lots of products in them if done wrong, so this crayon adds just the right amount of colour and shape that it doesn't look unnatural when I've gone bare with my base. To finish, I apply some lip balm and spritz my face with the Caudalie Beauty Elixir* to add a luminous look and pull the makeup look together.